EnergyAustralia is an energy retailer and power generator with interests in New South Wales and Victoria. In 2011, the NSW government owned EnergyAustralia business was bought by TRUenergy, a subsidiary of CLP which owns and operates the 1480 megawatt brown coal-fired Yallourn W power station in Victoria, Australia. TruEnergy also operated as an energy retailer in Victoria. From October 2012, TRUenergy has adopted the EnergyAustralia name nationally. The company has been criticised for its often dire predictions about the impact of carbon pricing while lobbying for government financial support. In 2008 TRUenergy's Richard McIndoe claimed that "the generators will be effectively bankrupt and therefore not able to operate from December 31" unless the proposed federal emissions trading scheme was weakened. As of February 2011 TRUenergy had a total of 3046 megawatt (MW) in generation assets including the 435MW Tallawarra and 180 MW Hallett power station, both of which are gas-fired. The company also has a 966MW hedge agreement for power from the Ecogen Newport power station and the Jeeralang gas-fired power stations in Victoria. TRUenergy also "manages a 50 percent share in wind farm development business Roaring 40s on behalf of its parent company, CLP." Mt Piper Power Station New South Wales 1400 0.9 4.6 2.5 million tonnes from Centennial Coal's Angus Place Colliery and 1.5 million tonnes from Centennial Coal's Springvale mine. Smaller amounts of coal are supplied from the Baal Bone, Invincible and Pinedale Collieries. In July 2009 when discussing the proposed Carbon Pollution Reduction Scheme, TRUenergy Managing Director, Richard McIndoe, told ABC TV that the company was "not doing any major maintenance at our power station in the La Trobe Valley this year, and we're putting that off until we've got greater clarity. Without the certainty of how much longer we're actually going to be able to operate down there, it's very difficult to justify spending $150 million this year on long-term maintenance plans so that's why we've had to really put these on hold." "I think that the CPRS legislation in its current form is going to result in less investment in the sector, which is going to undermine the reliability of the generation sector, leading to potential interruptions in supply going forward. It certainly will lead to a situation that doesn't have the same level of high reliable generation and electricity generation that we have today," McIndoe said.McIndoe claimed that with $950 million of debt scheduled to be refinanced in 2009 the company had decided to defer major maintenance. Commenting on a survey by the Electricity Supply Association of Australia Fitch energy and utilities director Gavin Madson said that "the more carbon-intensive generation assets are exposed to significant refinancing risk." The Age reported that "TRUenergy Holdings Pty Ltd (with a BBB+/Stable rating) which owns the Yallourn power station, also has significant maturity this year and in 2011. However, the company's credit profile benefits from some asset diversification and ownership by a strong parent - CLP Holdings Ltd (A+/Stable)." In November McIndoe touted potential new gas-fired power stations as a possibility, but only if the company's finances were protected. "The proposed power stations will emit a quarter of the CO2 of the traditional brown coal generators, which they will ultimately replace. Whether or not these power stations proceed represents a test as to whether or not the Government's CPRS actually ensures low emissions investments to replace existing, emissions intensive coal-fired generation ... It takes over three years to permit and develop any new power station. If these developments do not go ahead, we see a very real risk of electricity outages in Victoria in the future." "We are concerned that TRUenergy and other generators are using the threat of supply shortfalls as part of a strategy to persuade the Australian Government to pay higher compensation to them. However irrespective of the merits of these claims for compensation, taken at face value these statements appear to raise alarming security of supply issues that we assume are of significant concern to the Australian Energy Regulator given its role in overseeing the operation of the National Electricity Market. In this context, we respectfully request that you urgently investigate TRUenergy’s claims that the reliability of electricity supply to Victoria – and presumably the rest of the National Electricity Market – is now at risk. We understand that such an investigation might include requesting the Australian Energy Market Operator to provide its reasonable opinion, under clause 4.2.7(c) of the National Electricity Rules, that short and medium term capacity reserves are at least equal to the required levels in accordance with power system reliability standards ... Furthermore we would be pleased if you would consider whether, pending the completion of your review, it would be appropriate for the AER to use its information provision powers to notify energy retailers and customers of TRUenergy’s statements and the implication of those statements being that it will be an unreliable counter‐party." In her response, Australian Energy Regulator CEO Michelle Groves was non-committal, stating only that they would "continue to actively monitor compliance by all registered participants, including generators with the Electricity Rules". Groves stated that concerns about security of supply were a matter for the Australian Energy Market Operator. 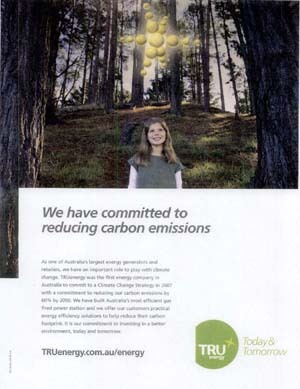 In November 2009, at the height of debate over the Rudd government's consideration over the introduction of an emissions trading scheme (ETS), TRUenergy launched an advertising campaign. 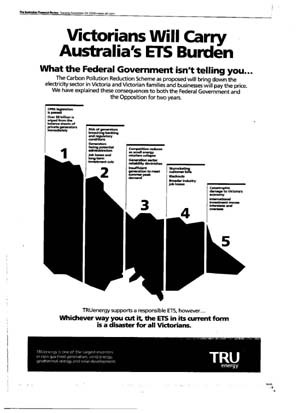 In its ad, TRUenergy stated the proposed scheme "will bring down the electricity sector in Victoria and Victorian families and businesses will pay the price." While stating that it supported "a responsible ETS", the advertisement stated that the scheme would result in "$8billion " being "wiped from the balance sheets of private generators immediately" which would result in "generators facing potential administration." The ad also warned that as a result there could be "insufficient generation to meet summer peak demand", that there would be "blackouts" and consumers would face "skyrocketing" bills. The cumulative impact, the ad warned, would be "catastrophic damage to Victoria's economy" and that "international investment moves interstate and overseas". The tagline at the foot of the advertisement stated that the company is "one of the largest investors in new gas-fired generation, wind energy, geothermal energy and solar development" but notably omitted any mention of its coal investments. At the same time, TRUenergy was claiming that it would propose a 1000 megawatt gas-fired power station adjoining the company's Yallourn power station. However, it argued it would only proceed if the proposal would only proceed if it obtained sufficient compensation under the Rudd government's proposed Carbon Pollution Reduction Scheme. "The proposed power stations will emit a quarter of the CO2 of the traditional brown coal generators, which they will ultimately replace. Whether or not these power stations proceed represents a test as to whether or not the Government's CPRS actually ensures low emissions investments to replace existing, emissions intensive coal-fired generation," TRUenergy managing director Richard McIndoe said. "It takes over three years to permit and develop any new power station. If these developments do not go ahead, we see a very real risk of electricity outages in Victoria in the future." McIndoe claimed that the Victorian coal-fired power generation sector would need, as a "bare minimum", $8 billion to $10 billion in compensation to subsidise the switch to cleaner power generation sources. Environment Victoria campaigns director Mark Wakeham pointed a an estimate that, under the proposed CPRS scheme, TRUenergy would get $738 million in free carbon permits for the Yallourn station over the first five years of the emissions scheme. "They are essentially arguing that the compensation needs to be at least doubled. I don't quite understand why … when they are going to make money out of it for the next 30 years." He described the company's approach of announcing a possible gas-fired power station and demand additional compensation as "verging on blackmail". The following year, TRUenergy placed a full colour advertisement in the Good Weekend magazine, which is a supplement to Fairfax's The Age and Sydney Morning Herald. The advertisement, which featured a smiling girl in a pine forest, is an example of massive understatement. The first line stated that "as one of Australia's largest generators and retailers, we have an important role to play with climate change". The advertisement proceed to regale readers with the company's commitment to reducing carbon emissions by 60% by 2050, how it had built gas-fired power stations and "offer our customers practical energy efficiency solutions to help reduce their carbon footprint." "It is our commitment to investing in a better environment, today and tomorrow," the advertisement concluded. TruEnergy group executive manager Michael Hutchinson told The Age that the company was holding discussions with a number of companies about allocating brown coal for the development of new technologies to dry coal for export. "Our long-term view is there is value in the brown coal [at Yallourn] and we want to be working with technology providers and others in providing environmentally sustainable ways of using the brown coal," Mr Hutchinson said. TRUenergy has submitted plans for up to 1000 megawatts gas power units at the existing Yallourn power station. It has also flagged the possibility of a separate 600 to 900 megawatts of gas peaking plant. In Victoria as of February 2011 TRUenergy's registered lobbyists were The Agenda Group. The company's registered federal lobbying firm is Govstrat. The firm's only registered lobbyist is Damian Power, who is also listed as one of the two owners of the firm. (The other owner of the firm is Louise Power, though she is not registered as a lobbyist herself). In New South Wales the firm's registered lobbying firm is Policy Solutions Group Pty Ltd, which trades as The Agenda Group NSW. The firm's two registered lobbyists are Mark Sutton and Lance Northey, though it is not clear which of them works for TRUenergy. ↑ TRUenergy, "The new EnergyAustralia FAQs", EnergyAustralia website, accessed January 2013. ↑ Melissa Fyfe, "Victoria: it's time to come clean", The Age, July 6, 2008. ↑ TRUEnergy, "About TRUenergy", TRUenergy website, accessed February 2011. ↑ TRUenergy, "Mining", TRUenergy website, accessed August 2010. ↑ "Operations & Community: Angus Place/ Springvale JV", Centennial Coal website, accessed May 2011. ↑ Sinclair, Knight, Merz, "Western Rail Coal Unloader", Delta Electricity, April 2007, page 2-1. ↑ 15.0 15.1 "Emissions scheme may bring power cuts: TRUenergy", ABC News, July 12, 2009. ↑ Geoffrey Newman, "Power cuts loom due to carbon uncertainty", Daily Telegraph, July 13, 2009. ↑ "ETS 'may hit power, utilities sector'", The Age, April 14, 2009. ↑ Michael Murphy, "Gas-fired power plant 'by 2013'", The Age, November 9, 2009. ↑ Environment Victoria and the Australian Conservation Foundation, "Investigation urged on blackout threat", Media Release, November 11, 2009. ↑ Bernard Keane, "Calling TRUenergy’s CPRS bluff", Crikey, November 12, 2009. ↑ Environment Victoria and Australian Conservation Foundation, "Letter to Mr Steve Edwell, Australian Energy Regulator", Environment Victoria, November 9, 2009. (Pdf). ↑ Michelle Groves, "Letter to Mark Wakeham and Phil Freeman", November 13, 2009. (Pdf). ↑ Mathew Murphy, "Gas-fired power plant 'by 2013'", The Age, November 9, 2009. ↑ Adam Morton, "TRUenergy plan 'close to blackmail'", The Age, November 10, 2009. ↑ Tom Arup, "TruEnergy promotes brown coal projects", The Age, June 5, 2012. ↑ Energy Supply Association of Australia, "List of members", Energy Supply Association of Australia website, accessed September 2010. ↑ Minerals Council of Australia, "Member Companies", Minerals Council of Australia website, July 2010. ↑ "The Agenda Group Pty Ltd", Public Sector Standards Commissioner, accessed February 2011. ↑ "Policy Solutions Group Pty Ltd", Department of Premier and Cabinet, New Soouth Wales Government, accessed February 2011. Alastair Phillips, Regulatory Manager, TRUenergy, "TRUenergy Submission: Feed-in Tarrif Review", Submission to the Victorian Department of Primary Industries Feed-in Tariff Review, 23 July 2010. Giles Parkinson, "Getting skeptical about TruEnergy’s ETS apocalypse", Crikey, March 20, 2009. Bearnard Keane, "Not so apocalyptic now — TRUenergy changes its tune", Crikey, December 16, 2010.